Xmarks Blog » LastPass Acquires Xmarks! Today we’re excited to announce that Xmarks has been acquired by LastPass, makers of a leading cross-platform password manager. It’s a great opportunity that ensures the survival of Xmarks as the same service that you know and love. 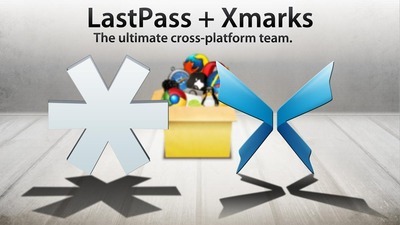 LastPass : The last password you'll have to remember: LastPass Acquires Xmarks! In our efforts to bring you expanded, go-anywhere access to your data, we're excited to announce that LastPass has acquired Xmarks! It's a great opportunity that not only ensures the survival of the Xmarks add-on, but will also enhance our mission to provide the best data-syncing tools out there. I’m pleased to announce that we’re in the final stages of completing a sale of Xmarks to a new owner who is 100% committed to keep our great browser sync service running smoothly. Tomorrow, however, will hardly be anything but typical, for tomorrow one of our engineers will start a script that will email each of our users to notify them that we’ll be ceasing operations in around 90 days. As promised, Xmarks for Safari on Snow Leopard is now stable and available for download. For our Safari users, you should already have received an upgrade notice, but if not, feel free to grab it from our download page. That said, if the pre-release (1.3) version works for you, or if you are still on MacOS 10.5 (Leopard), there is no compelling reason for you to upgrade at this time if you don’t wish to. Xmarks for Safari (Snow Leopard対応版)　Coming soon! Now that we're happy using it ourselves we're releasing it here first so you guys get it as soon as possible.